To Sharon Creech, author. From Carina Ripley. I can’t remember your name. Or what the book was called. It was written in poems and was about a girl who drew an apple every day for a month, observing it as it rotted. The apple was a metaphor for the girl’s life as it fell apart around her. It was a library book; I’ve tried to remember your name, googling different things. I want to own a copy, to read it again and see how it makes me feel now. 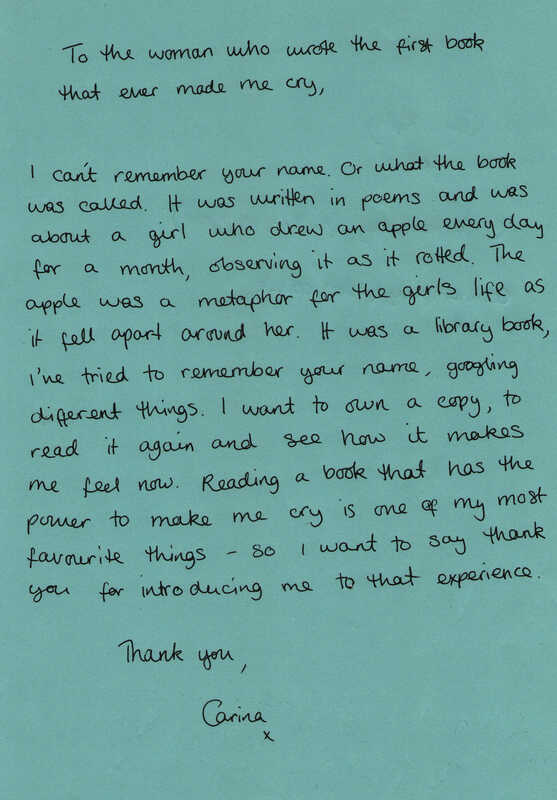 Reading a book that has the power to make me cry is one of my most favourite things - so I want to say thank you for introducing me to that experience. author. Born 1945. More information about Sharon Creech.